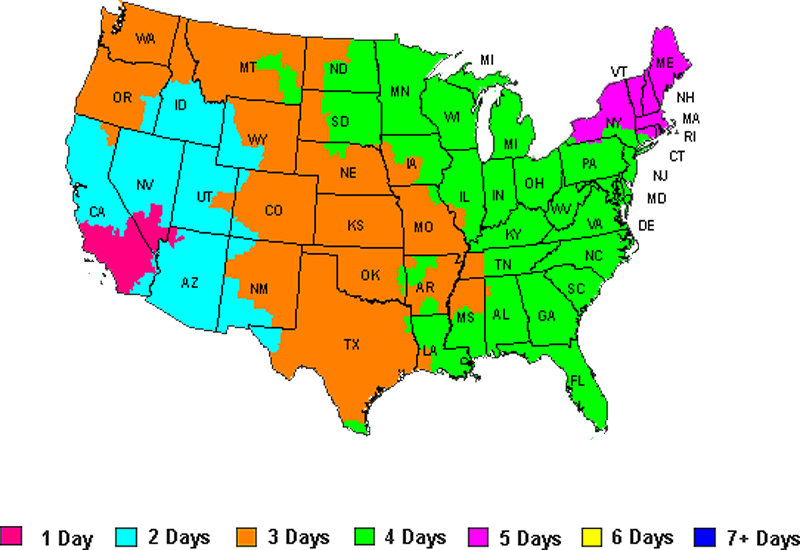 Free shipping is free to the 48 Continental United States. Almost all orders are shipped FedEx ground and take between 3 and 7 days to arrive after shipping date. Shipping can be upgraded to 2 day delivery after the ship date. The ship date and order date are not the same thing. All items are made to order and can take between 3 and 10 days to manufacture. Use the graphic to the right to estimate how long it will take for your order to reach your destination. If a tracking # is provided by the shipping carrier, we will update your order with the tracking information. Please note that some orders using specialized FedEx services will not have tracking numbers. We allow our customers to return or exchange items purchased from us as long as a request is made within 14 (fourteen) days of receipt of product. If you aren't pleased with your purchase you can return it for a refund so long as you follow the guidelines listed below. All returned orders could be subject to a 20% restocking fee. Orders that are canceled before shipment could be subject to a $10.00 cancellation fee. Any product that is refused upon delivery, the customer is responsible for shipping of the product both ways. We will exchange any UNUSED item for another item of equal value. If the new item is of greater value, customer will be responsible for any price difference. If new item is of lesser value, difference could be subject to a restocking fee. Customer is responsible for all shipping of exchanged items. Customers must carefully choose product customizations because custom products and/or accessories can only be returned for a replacement of equal or greater value. These items are custom made for each order to specific requirements and can no longer resold at the same price. 1. Customer MUST obtain an Return Merchandise Authorization. We can not accept any item for return without a valid RMA number from an authorized representative of RacingFurniture.com Please call us at (909) 993-5535 / fax us at (909) 993-5546 or email us at returns@racingfurniture.com with reason for return. 2. Customer MUST return item in original UNUSED condition. We cannot accept any returned item that does not have its original included parts, is not in its complete and sellable original packaging, or has already been installed. Any items that have been returned in poor condition or missing parts will NOT be credited and will be returned at the customers expense. 3. Customer MUST pay for shipping to return item. We will not pay the shipping fees to have the item returned to us.